Only found at the Fall Sportcard & Memorabilia Expo in Toronto from November 6-8, the 2015 Upper Deck Fall Expo Hockey promo packs offer collects plenty of exclusive options. Featuring the 200-card base set in 2015-16 Upper Deck Series 1, Midnight parallel cards include a dark pewter foil and print run of 25. Also showcasing a dark color scheme, Victory Black Rookies offer 16 subjects, each numbered to 125. 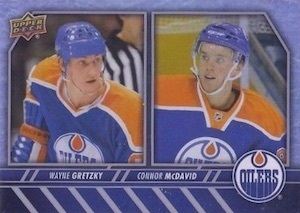 Although the SP-1 and SP-2 are found in Series 1, SP-3 pairs Wayne Gretzky and Connor McDavid and is only found in the Special Fall Expo packs. Among the hits, Parkhurst Priority Signings are numbered to 75 or less while Parkhurst Priority Signings Exclusives up the ante with bigger names and prints runs of five or less. Also, there are 15 one-of-one instant redemptions for select UDA memorabilia. The special foil packs are only available based on eligible purchases at the show from UD Certified Diamond Dealers. Each two-card pack includes one Midnight parallel and then the second card can be any of the options including another Midnight card. In addition to a program geared to box breakers, there is also one for those that are interested in opening by the case. 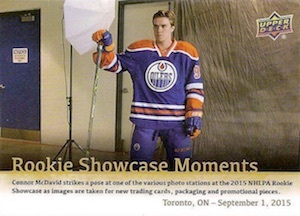 An added bonus at the event, the first 300 customers each day receive one NHLPA Rookie Showcase Memorable Moments card that chronicles Connor McDavid's experience at the private event. 16 cards. 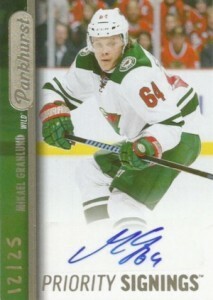 Serial numbered #/125. 15 total cards good for 1/1 UDA memorabilia. If this is indeed correct, I find it interesting that this must have been the prelim CL for UD1. 5 changes between this checklist and the UD1 checklist. Kevin Mitchell � This checklist came straight from Upper Deck. 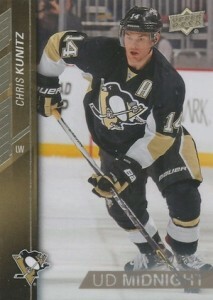 Card #44 has been listed on eBay and the Midnight is indeed Toews matching the UD1 checklist and not the Midnight checklist. 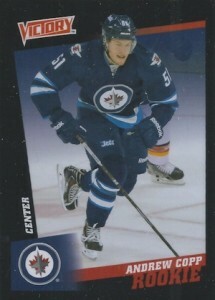 Card #178 has also been listed on eBay and the Midnight is indeed Tanev matching the UD1 checklist and not the Midnight checklist. It’s obvious that the Midnight checklist is incorrect.